Welcome to our feature, the Saint Hedwig Virtual Tour. Here you can tour and read about different things located within our beautiful Church. You can see photographs of our beautiful Altars, Stained Glass, Statues and much more! Saint Hedwig Parish was Founded July 3, 1903 and a combination Church and School structure was constructed a few yards to the south of the present day Church. By 1910, the Parish grew so rapidly that the existing structure would no longer handle the school children and worshipers. In 1911, Construction began on the "Lower Chapel". Due to financial constraints, only the basement or "Lower Chapel" was completed. On November 12, 1911 the first services were held in the New Chapel. Now the old church could be remodeled into classroom space which was so desperately needed. In the beginning of 1915, plans were going forward to complete the New Church. In April, work had begun, and was completed by December 1915. The Architect was Harry J. Rill, Joseph Nowakowski was the mason, Thomas Jurkiewicz was the Plumber, and Leonard P. Stentzler was the painter and decorator. Finally after many months, the Church was completed for First Services in the New Church on Thanksgiving Day, November 30, 1916. The Upper Church can seat 2,000 people, and the lower could seat up to 1,200 people. 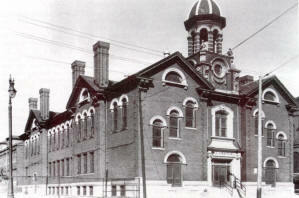 After the original building building was demolished, and three subsequent school buildings were built, the Lower church was removed, and remodeled as a Parish Hall. The tour is very Easy. You have a couple of choices. One you can click on the numbers and letters in the small circles on the two following plans. You can also proceed to the bottom of the page, where you will find the circles again with text descriptions which you can click. All images are copyright of St. Francis D'Assisi - St. Hedwig Parish, Use of images for any purpose is strictly prohibited unless consent of webmaster.